Parody advertisement from Greenpeace's mock "Arctic Ready" website. Royal Dutch Shell, the massive multinational oil company, badly wants to be ready to drill for oil in the Arctic Ocean next summer. This year, the company's plans to begin drilling in the treacherous seas of the Arctic were thwarted by its late start and repeated failures to get even basic oil spill response equipment into place. But the full extent of the company's failed attempts to test oil spill response gear was recently revealed by Seattle's NPR radio affiliate KUOW. Shell has faced repeated criticism and regulatory scrutiny over its cavalier attitude towards Arctic drilling, and the KUOW investigation makes clear why Shell is not "Arctic Ready" by a long shot. Documents obtained by KUOW through FOIA requests indicate that Shell's oil spill response gear failed spectacularly in tests this fall in the relatively tranquil waters of Puget Sound. The containment dome - which Shell sought to assure federal regulators would be adequate to cap a blowout in the event of emergency at its Arctic operations - failed miserably in tests. The dome "breached like a whale" after malfunctioning, and then sank 120 feet. When the crew of the Arctic Challenger recovered the 20-foot-tall containment dome, they found that it had "crushed like a beer can" under pressure. That was the embarrassing news that emerged from documents released through FOIA from the federal Bureau of Safety and Environmental Enforcement, which required the tests of Shell's proposed oil spill response system. "It failed under very calm, tranquil conditions in the best time of year up here in the Pacific Northwest. If it can’t handle the best we have here, I really have my doubts it can handle even a little adversity in the Arctic." Federal regulators are reviewing the wisdom of Shell's Arctic adventure, and are calling for more real-world testing in the Arctic Ocean to see how the oil spill response gear would stand up to extreme conditions. Besides the horrifying prospect of an out-of-control oil disaster in the far north, why would the Obama administration want to flirt with catastrophe in the Arctic when there is (supposedly) a huge oil boom going on in the Lower 48 anyway? If there really is such a glut of recoverable oil in unconventional shale plays via fracking, then why would the U.S. or any other nation allow Big Oil to rush into the Arctic? If Shell is this ill-prepared to operate critical safety equipment in the calm waters of Washington State, then they clearly have no business drilling for oil in the Arctic. The bar for Obama administration action on climate has become so low that it doesn’t take much to get people excited. For example, the President used the words “climate change” during his recent state of the union address, having failed to mention this existential dilemma last year. Some people read a lot into that. So, yesterday, it was unsurprising to see an over-excited reaction to a State Department announcement on a new climate initiative. President Obama’s Secretary of State, Hillary Clinton, called a press conference to announce that the United States and several other countries would start a new, official collaboration to reduce short-lived climate pollutants, such as methane, black carbon and HFCs. However, it’s pretty clear that this is no announcement about US policy to reduce climate pollution. It’s great countries are talking, but also not new. The US contributed $12 million for this collaboration. This is is about what Mitt Romney would have earned after taxes if he paid the same tax rate my mother does. $12 million is lot of money for one person, but for an intergovernmental partnership to tackle global climate disruption, it’s laughable. The best thing about Secretary Clinton’s announcement yesterday is that the Obama administration publicly professed to being active on climate, and reiterated actions they’ve been taking already to reduce climate pollution. The worst thing about yesterday’s announcement is that it reminded everyone of what the Obama administration has done to increase climate pollution. A large funder of Obama’s campaign in the past, who has contributed $35 million to campaigns and environmental causes, announced her support was gone because of Obama’s failures on climate. Let’s put this in context. A lot was achieved up front when the President pushed for passage of the American Recovery and Investment Act of 2009. The bill included grants and tax incentives for efficiency and renewables production and research, smart grid development, and low-emissions vehicles. The Obama administration has continued to press continuing incentives for renewables and efficiency. The Environmental Protection Agency has not yet implemented any standards for large stationary sources of climate pollution that have any significant impact, but the new vehicle standards will have an impact. Expectations for EPA, however, remain much higher than for the rest of the Obama administration, and we still hold out hope for climate pollution standards to be strengthened on both vehicles and stationary sources. So far, we can’t put a number on how much less climate pollution the world will see because of the Obama administration. We can say that the US goal of 17% under 2005 levels by 2020 is so unambitious that it was possibly imminent before the President announced it. We can also say that the Obama administration may be doing as much to increase climate pollution through other measures. Although the President has continued to call for the removal of fossil fuel subsidies, the reality is that his administration has been a great friend to coal, oil, and gas. President Obama’s administration has decided to increase coal mining on public lands, for example in Wyoming where federal leases will allow mining of about 758 million tons of coal. Although some of this coal will definitely be burned in the US, the administration intends to use coal mining expansion to help meet its goal of doubling exports by 2014. So, although we will succeed at shutting down old coal-fired power plants in America, US coal can still contribute to as the largest global contributor to climate disruption. In the first quarter of 2011, US exports of coal rose by 49% compared to the same quarter of 2010, amounting to 26.6 million short tons. This is the highest amount of coal exported since 1992 (when 27 million short tons were exported). Similarly, if vehicles in America become more efficient, the plan seems to be to make sure the oil is burned anyway. 2011 was the first year in almost two decades when the US became a ‘net exporter of fuel’. In each day of February, the US exported 54,000 more barrels of petroleum than it imported. To add insult to injury, the Obama administration now appears bent on drilling in the Arctic which is more accessible to climate polluters because they’ve made the ice melt. An irony about the State Department initiative to reduce emissions of methane is the Global Shale Gas Initiative, and other efforts by the Obama administration, to push US methane (natural gas) abroad. There is a likelihood using shale gas for electricity leads to emissions as high as with coal, or higher. Shale gas that is liquified, transported, thousands of miles, and re-gasified I argue certainly has a higher carbon footprint than local coal. It seems the general attitude among climate advocates has gone from glum to numb. To be fair, our despair about climate policy is fueled by the undying Republican platform that environmental ignorance and scorn are praiseworthy. There are also Democrats who have donned ignorant and scornful attitudes about climate disruption, but mostly their problem is letting Republicans spearhead the debate on climate. Climate disruption for the Obama White House seems to be viewed not as a real problem but a political problem. Rachael Robson was a co-author of this blog. In typical form, Jack Gerard of the American Petroleum Institute released a video claiming that holding oil companies accountable during offshore drilling operations and after oil spills will have the usual dire economic consequences: job loss, higher taxes, and "driving small-and mid-sized firms out of business and shutting down access to domestic energy resources." This follows common scare-talk any time an industry giant faces new regulations in the public interest--ballooning the price tag of improving worker safety conditions or environmental precautions and predicting economic apocalypse. As if the oil industry isn't making enough money, or spending enough money, buying Congress to prevent ever-dreaded accountability legislation. Keep in mind, Jack, that history shows how frequently cost estimates of environmental regulations are blown way out of proportion beforehand, while it is actually cleanup costs that are grossly underestimated. Kindly send a memo to BP, Halliburton, and your other members as well on that one. While Gerard will never admit it, an Energy [R]evolution is possible, and calling out those who value green paper over a green planet is a vital part of getting the public behind real solutions: energy conservation and efficiency, a decentralized renewable energy economy, and a phase-out of the dirty fossil fuels that have led to global warming. Stalling and obstructing are not coveted American values, but innovation is. It's time to go beyond oil, where the fortune of dirty influence peddlars like Jack will just be a stain on history. 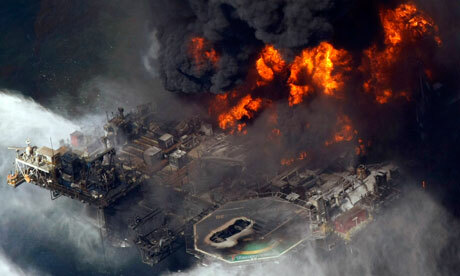 "A 2008 Chevron blowout appears in hindsight to have been a rehearsal for Deepwater Horizon and its design problems. Like BP, Chevron was in the final stages of drilling a well aboard Transocean rig Discoverer Deep Seas. Because of the blowout, drillers lost 500,000 gallons of drilling mud into the earth below the wellhead, and spilled 293 gallons onto the ocean floor." Full article: "Deadly Gulf blowouts persist"